Terminix (update: the app is now called Tilix) is a GTK3 tiling terminal emulator. The application allows splitting terminals horizontally and vertically, arranging them using drag and drop, along with quite a few other useful features. 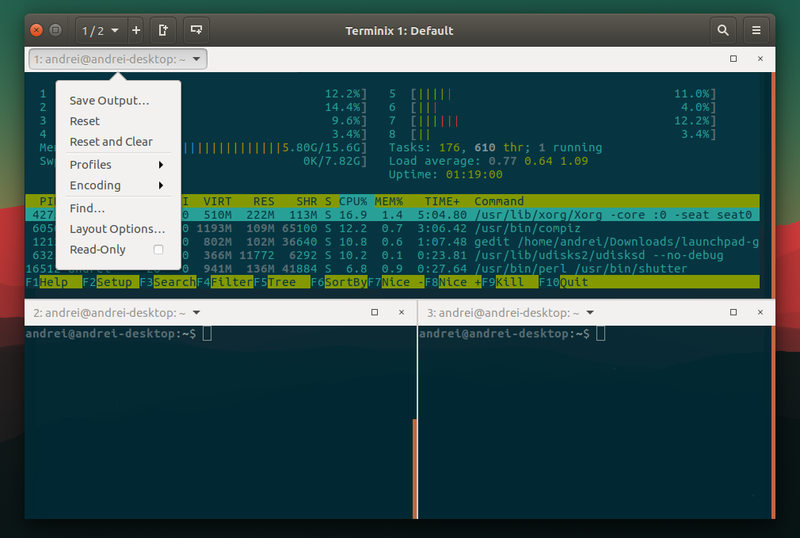 Check out the Terminix GitHub page for a feature overview. Back in September, Terminix 1.3.0 was released with Quake mode support, and the latest Terminix 1.3.5, released recently, improves this feature with two new options, while also providing a few other enhancements. 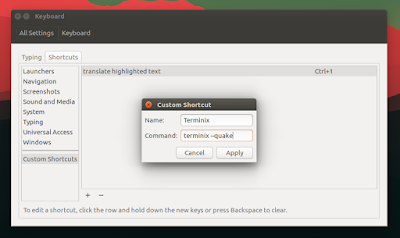 The Quake mode makes Terminix behave like a drop-down terminal, similar to Guake or Yakuake - it is invoked and hidden using a single key. However, Terminix works a bit differently, because you can't assign the keyboard shortcut from within the application, so you must set it from your system settings. various bug fixes. The bug that caused a segfault when trying to use the feature that allows inserting a password from GNOME Keyring seems fixed (I mentioned this HERE). Note that if you use the new option to hide Terminix when focus is lost (in Quake mode), you won't be able to access its menu under Unity, because clicking on the top panel hides Terminix. A workaround is to launch a regular Terminix instance and change its options from there. 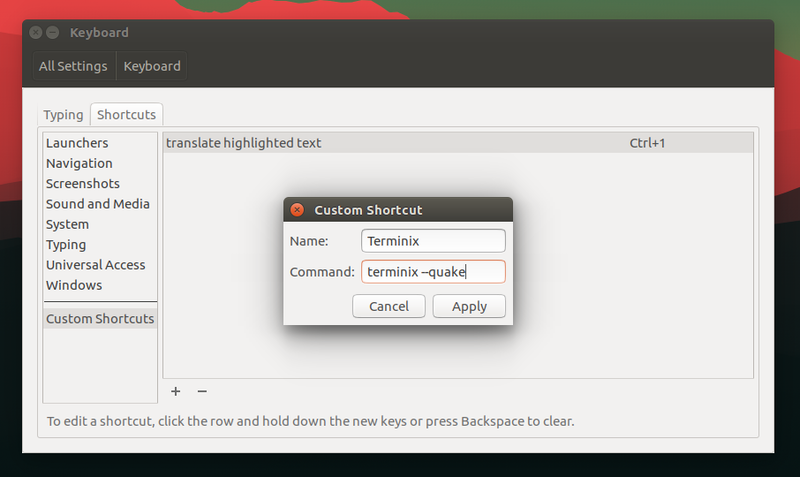 To use Terminix in Quake mode, you must launch it with the "--quake" option ("terminix --quake"), and assign this command a keyboard shortcut in your system settings. Then assign it a keyboard shortcut. Make sure not to use shortcut that's already in use! Note that the Ubuntu 16.10 Terminix package is built on Ubuntu 16.04 because it can't be built in 16.10 (due to ldc not building in Ubuntu 16.10 on Launchpad). However, I'm using it in Ubuntu 16.10 and I didn't encounter any issues. 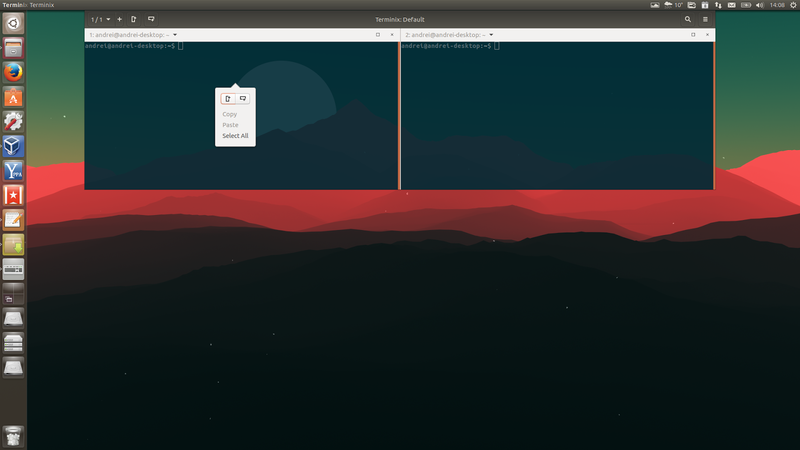 For how to install it in other Linux distributions, bug reports, etc., see the Terminix GitHub page.